IEC 60309 (formerly IEC 309) is an international standard from the International Electrotechnical Commission for "plugs, socket-outlets and couplers for industrial purposes". The highest voltage allowed by the standard is 690 V DC or AC; the highest current, 250 A; and the highest frequency, 500 Hz. The temperature range is −25 °C to 40 °C. IEC 60309-1 specifies general functional and safety requirements for any form of industrial high-current power connector. IEC 60309-2 specifies a range of mains power connectors with circular housings, and different numbers and arrangements of pins for different applications. 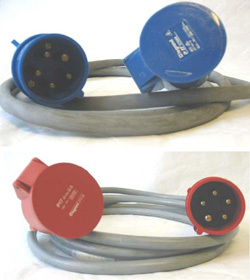 IEC 60309-3 dealt with connectors for use in explosive gas environments, but was withdrawn in 1998. IEC 60309-4 concerns switched socket-outlets and connector interlocks. In the United Kingdom, this standard was first adopted as BS 4343:1968 and has since been replaced by its European equivalent EN 60309:1999, catalogued in the BSI system as BS EN 60309:1999. In the U.K. these plugs are often referred to as Commando, CEE industrial, CEE form or simply CEE plugs. IEC 60309 plugs and sockets are identified by colour. The national mains power around the world are almost always based on a frequency of 50Hz or 60Hz, so the colour coding refers to the voltage. Effectively the most widespread colour codes are yellow 110 V, blue 230 V and red 400 V. The black 500 V colour code can often be found on ships. IEC 60309-2 connectors are produced in many variants, designed so that a plug of one type can only be inserted into a socket of the same type. Different current ratings (such as 16 A, 32 A, 63 A and 125 A) are distinguished by different diameters of the circular housing. Different voltage and frequency combinations are distinguished by the location of the ground pin (or a plastic projection called the minor keyway, for connectors with no ground pin), as shown in the following table. The ground pin can be in one of twelve locations spaced at 30° intervals around the circle on which all the pins lie. The various positions are referenced from the view of the open side of a socket; the 6 o'clock (180°) position is at the same angle as the major keyway, and is oriented downwards. The major keyway is a projection on the plug casing that aligns with a notch on the socket. The ground pin has a larger diameter than the other pins, preventing the wrong type of plug being inserted in a socket. A six-phase plus earth (6P+E) version also exists. The most common plug types are CEE yellow 2P+E, CEE blue 2P+E, CEE yellow 3P+E, CEE blue 3P+E and CEE red 3P+N+E. The colour of the casing refers to the regional electric power distribution at either 110/120 Volt = yellow, 230/240 Volt = blue or 400 Volt = red. 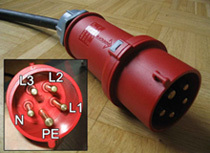 he red 3P+N+E, 6h (180°) plug is the most common connector as it allows to connect to the widespread 400 V three phase power network that reaches many domestic places. The most common ratings are 16 A, 32 A and 63 A – only in some cases the higher specifications of 125 A and 200 A is used. Construction sites in central Europe have most of their cabling setup with this three phase socket type as the single phase to neutral voltage is 230 Volt usable for other devices. The five pins are positioned in a circle with the ground connector E to be thicker and longer than the network pins. When looking at the socket the three hot pins L1, L2, L3 are supposed to make for a clockwise turn; i.e., to have their high in the order L1 first, then L2, and L3 last. As some domestic wiring does not support this assumption (which could make some motors turn backwards) many machines on construction sites feature a phase swap plug that allows to swap two pins. Three-phase induction motors (delta connected) do not need the neutral wire to function so that there is also a four pin variant of the IEC 60309 plugs for three phase power. For their usual occurrence, it is often called farmer three phase (German "Bauerndrehstrom"). Although not actually allowed by the standard, in some wiring setups a five pin socket is attached to a four wire cable so that the neutral pin, N, is not connected. In that case 230 Volt between phase and neutral is not available but 400 Volt equipment with its usual five pin plug can be connected without an adapter. The blue P+N+E, 6h (180°) plug is a single phase connector that is especially common in camping vehicles and sockets to be found in caravan parks and yacht marinas throughout Europe including the British isles. The Caravan Mains Socket has almost universally replaced other 230 V domestic plugs since they are inherently safe to standard IP44. When sockets are mounted looking downwards then the connector system reaches IP53 that is safe to use in outdoor settings under all weather conditions. 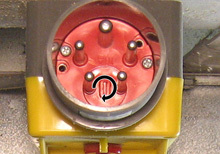 The yellow P+N+E, 4h (120°) plug is a single phase connector that is in widespread use on the British Isles. This socket type was used with the MK Commando which lead to all IEC 60309 sockets to be called Commando sockets later on. The blue 3P+N+E, 9h (270°) plug is a three phase connector available in areas with both 110 V and 240 V supply systems (mains). It is prevalent in the outdoor event lighting and audio power industry as an outdoor-safe replacement for NEMA-connectors. 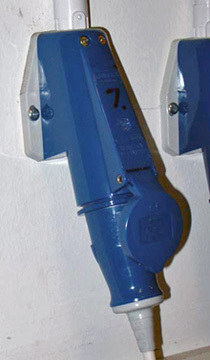 In the United States it is not usually used for three phase power but for the high leg delta wiring of split-phase electric power (unknown in Europe). This allows one to choose single-phase AC power at either 110/120 Volt between phase and neutral or 220/240 V between phase and phase. Since these two modes do not need three phases there is a non-standard yellow four-pin connector available designed for a single-phase 110/120 or 220/240 V load.